This review first appeared in the September 2010 issue of hi-end hifi magazine High Fidelity of Poland. You can also read this review of the GigaWatt PC2-EVO in its original Polish version. We publish its English translation in a mutual syndication arrangement with publisher Wojciech Pacula. As is customary for our own reviews, the writer's signature at review's end shows an e-mail address should you have questions or wish to send feedback. All images contained in this review are the property of High Fidelity or GigaWatt - Ed. Today’s review subject, the Polish GigaWatt PC-2 EVO power conditioner, kicks off a completely new series of AC line filters to their PC-4 we tested earlier. 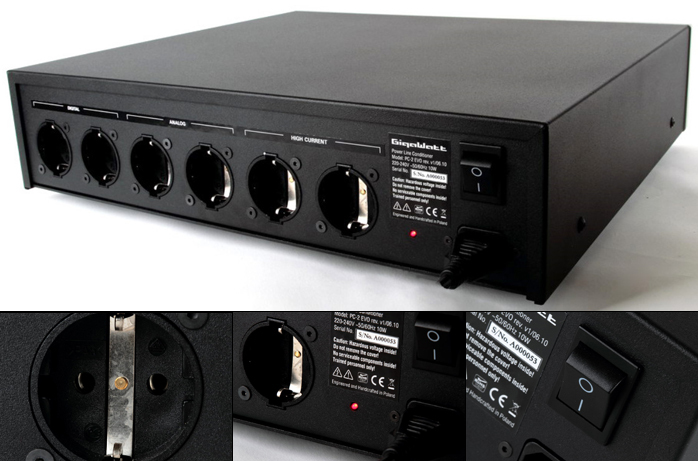 The most important difference is that the fully modular PC-2 EVO uses no isolation transformers which previously filled the role of an additional filter branch. 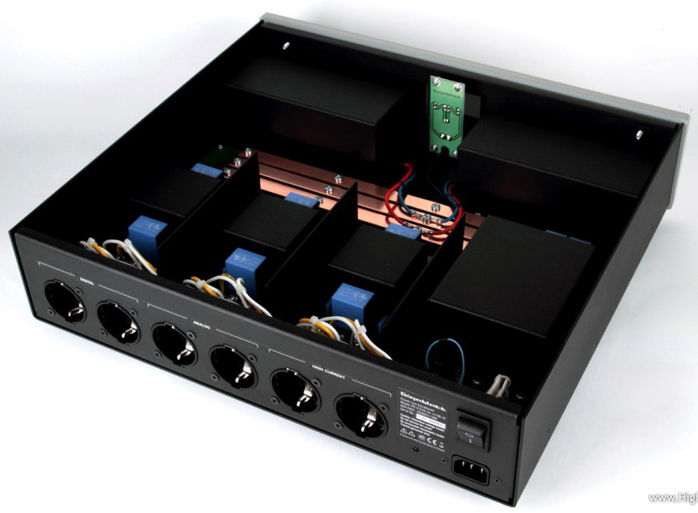 It is instead based on multistage independent passive LCR filters that are individual for each of the three branches (digital, analog and high current). Noise is filtered by special low-inductance metalized polyester foil capacitors supplied by the German BASF company who manufactures in a Philips plant. The complete conditioning circuit is built up on a massive PCB and soldered with silver solder to three high-purity copper billet distribution bars with a cross section of more than 30mm² each. These bars insure stable steady power distribution regardless of the draw on each leg. The construction difference between this new conditioner and the preceding version is so significant that we now deal with actually three discrete units inside one enclosure where each filter is precisely tuned to the kind of load that will be attached to each duplex which is fitted with silver-plated and demagnetized sockets. The filter action is supported by a new generation of twin-buffer circuit with compensation cells to increase current capacity with non-linear loads like power amplifiers and to prevent power sag between input and output. The conditioner eschews traditional protection like over-current or thermal fuses to avoid their compromises. Except for their low price and obvious protective functions, such devices all throttle back the power that is supplied to the circuit they protect due to their very low cross section. The PC-2 EVO arrives with the company’s own LC-1 MkII power cable but a 900zł surcharge can upgrade to the new LC-2 MkII cord. Company owner Adam Szubert explained the LS-1 cable: "Sometimes clients question why the LS-1 is so expensive and why we offer nothing between the LC-1 and LS-1 cords. From the very start the LS-1 was dedicated to our top PC-4 conditioner and used internally in all its power branches. We were simply unable to finalize the external cable prior to the introduction of the PC-4. That’s why the LS-1 was not planned as a subsequent release after the LC-2 but as an all-out partner that would not limit the PC-4’s performance. So it is an expensive cable and our top cord. It also begins a new series of cables, LS for Link of Silver. These are made from better silver-plated conductors as opposed to the cheaper LC Link of Copper series. "The LS-1 project relied on proprietary components manufactured to our specification. This takes time to design, then source. Work on the cable and listening tests took a long time but still we didn’t have a steady supply of materials which would ensure the repeatability of each hand-assembled cable. The LS-1 employs no off-the-shelf parts. The cable really is made by hand and I’m not talking about just attaching plugs to spool wire. Handmade here means from scratch. First you need to build up the conductor weave, the shield and the Teflon isolation to create the cable geometry, then the external isolation and passive filter elements and only then can the plugs be attached. 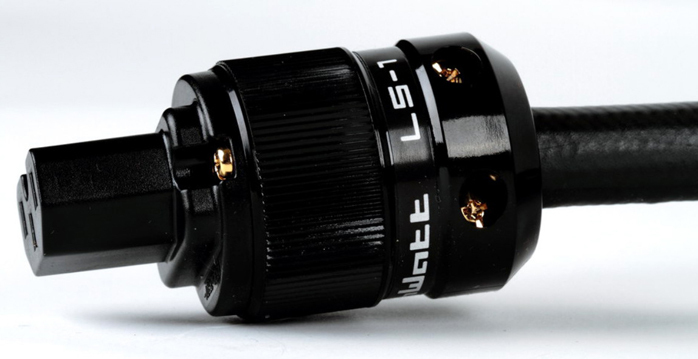 "For the LS-1 we also had to design new plugs to fulfil our quality standards. After analysing the requirements and then technological capabilities, we learned that we could not manufacture the plugs in Poland. Instead we began collaborating with a Far Eastern factory that specializes in quality connectors and produces connectors for many famous audiophile companies. Having researched the competency of that factory and evaluated their material and product samples, we submitted our specifications for the GigaWatt plugs. 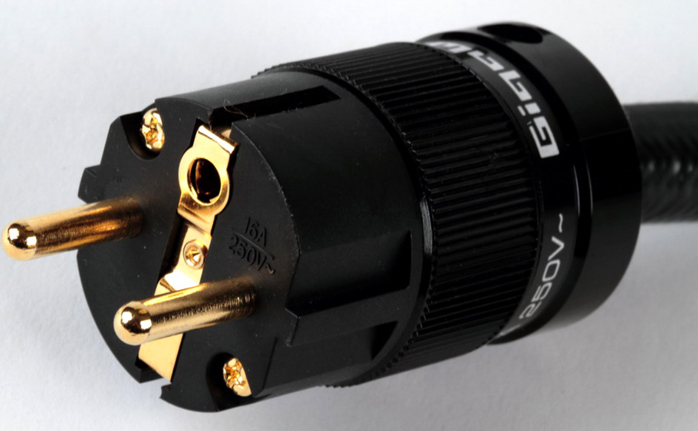 Among others this specification includes precise manufacturing tolerance for all parts of the plugs including the casing, connector, nuts and bolts materials, isolation and arc-over resistance, the quality and thickness of the gold plating and the itemized schedule for the cryogenic and demagnetization processes. "Companies like Wattgate, Oyaide, Marinco, Acrolink and Furutech (the latter also offers proprietary plugs) mostly use pre-existing parts platforms, then modify them to a lesser or greater extent, brand them with their logo and protect the changes with a patent. We now have our very own plugs similar to Wattgate and Furutech. Occasionally these plugs may come from the same factory but they will have completely different material specifications and in our case the construction changes of the casing require different molds. This involved higher start-up costs for our project but these parts are now proprietary to us. "We also implemented very high-quality dielectric for the conductors. The technical process as well as material quality was beyond Polish suppliers hence production was granted to a German company, which now manufactures many of our conductors made from silver-plated oxygen-free copper sheathed in Teflon insulation. Similar conductors with higher cross section are used for the internal wiring of the PF-2 strip and PC-3SE and PC-4 conditioners. The construction of the LS-1 cable requires a few of those conductors per leg. Before we introduced the cords more than a year ago, they were sent to a few dozen beta testers who owned GigaWatt products including older versions of our cords. Both new cables were enthusiastically received and could actually have been offered as completely new model designations. Due to the very good reputation of the predecessors we simply decided to stick with the old names, adding only a Mark II suffix. The new cords are now standard trim or optional upgrades for all our products."